Anna Elizabeth “Aunt Sissy” Morrison loved Hazelwild Farm and the children she taught there more than the money developers had to offer for a prime piece of real estate in Fredericksburg, Va. In forming the Hazelwild Farm Education Foundation, Morrison established the framework of an organization that could preserve the land for diverse educational purposes – and thus preserve the land for horses, too. Morrison witnessed rural land give way to development. The building of the Interstate Highway system in the late 1950’s severed the farm that had been in her family for generations. A mall was built along Route 3, just a few miles north of Morrison’s land. Morrison was ahead of her time. She knew the farm would not survive unless it diversified its business and formalized its cultural value to the community. In forming the Hazelwild Farm Education Foundation as a 501(c) 3, she established a protection program that would outlive her, creating a sustainable business model which has enabled others to realize and even expand her vision, and carry it from one generation to the next. Morrison’s generous spirit and business savvy have conserved equestrian opportunities for thousands. Even to those who never met her, she is appreciated as Aunt Sissy, a nickname bestowed on her by her preschoolers that stuck. Generations have visited the farm as children, teens and young adults, and continue as adults – riding, volunteering and working. Teresa Seay, the current equine director, first came to Hazelwild for first grade. “Then I started camp and camp got me riding here,“ Seay said. Seay remembers a favorite horse from her first years riding, Seay oversees a staff of three full-time equestrian workers. Both Seay and her assistant direct are United States Hunter Jumper Association (USHJA) certified trainers. They provide hunt seat equitation lessons and coach at horse shows and clinics on the weekends. The University of Mary Washington Riding Team is hosted at Hazelwild and participates in the Intercollegiate Horse Show Association. 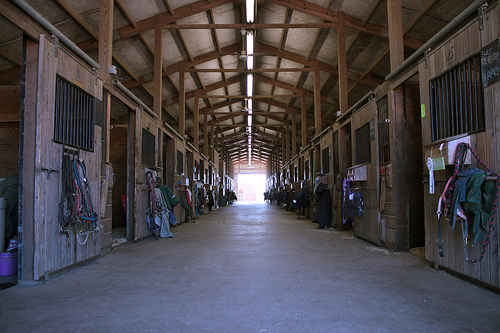 The team was moved to Hazelwild when their stables were closed. University students can also earn P.E. credit taking lessons at Hazelwild. The farm is home to about 90 horses divided between privately owned and school horses. There are two boarder barns, a school barn, a 250′ X 150′ indoor riding arena, a 300′ X 150′ outdoor riding arena and a 200′ X 100′ outdoor riding arena. Hazelwild Farm riders also have access to miles of trails on the farm’s 500 acres. For the most part, the preschool still supports the horse program. “We like to think the diversity of our offerings has helped us stay afloat,” Lanford said. “The horse business is not a money maker because you have to keep the cost [of participation] affordable, while your costs for wages, farriers, fertilizer, etc., continue to increase,” she said. “It’s so very hard to balance out,” Lanford said. “Bankers tell you how to do your budget. But that doesn’t work in the horse business. You can’t budget for drought or an equine virus that requires inoculations and increases your vet bills,” she said. In spite of the challenges, the land has remained intact. “We’ve sold none of it, but do sometimes think how that land could provide [financially for the needs of the farm],” Lanford said. To help the farm support itself, the facilities are rented to outside groups. Carrie Sakowski and Jennifer Summon rent Aunt Sissy’s farmhouse for their Bits and Pearls Equestrian Tack Boutique. “The owners are both parents of riders here,” Seay said. The renovated dairy bar is available for rental, as well as the indoor riding arena. Gegi Winslett of TWA Horse Shows has rented the indoor ring since the early 1990s for her annual Hunter-Jumper winter series. “Forming the foundation was the smartest thing she ever did,” Winslett said of Morrison. “Her 501(c)3 has preserved the land, the open space and the educational opportunities,” she said. “She was a teacher and her main concern was teaching children,” Danielson said. “She set up the foundation to protect the farm; to protect the horse aspect and the education aspect. That was her goal with the foundation,” Danielson said. “She did the right thing to put the farm into a foundation and preserve it. The developers would have otherwise had it by now,” Danielson said.